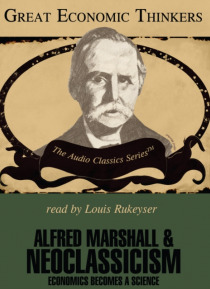 Alfred Marshall (1842-1924), a British economics professor at Oxford University, developed economics into a more rigorous, professional discipline than ever before. He invented concepts such as price elasticity, the representative firm, consumer's surplus, and other ideas that significantly enlarged the "e;analytical tool kit"e; of the economist. Darwin's ideas about biological evolution e… specially influenced Marshall, who learned a great deal about economic behavior by viewing a business firm as a biological organism, complete with a life cycle. He is perhaps best remembered for explaining the interaction of supply (i.e. costs of production) and demand (i.e. consumer utility), using the famous "e;scissors"e; metaphor to explain how these forces determine the price of an object. The Great Economic Thinkers series is a collection of presentations that explain, in understandable language, the major ideas of history's most important economists. Special emphasis is placed on each thinker's attitude toward capitalism, revealing their influence in today's debate on economic progress and prosperity.